One of the books given to the attenders of the recent “Together for the Gospel” conference was the recent volume by C.J. 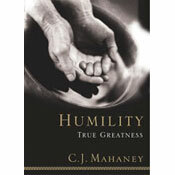 Mahaney titled Humility: True Greatness. I had actually wanted to buy and read this book for sometime, but had not yet done so. Well, I read the book this week and it is incredibly helpful! I pray that God will use what I learned in this book to aid my sanctification for His glory. The book is both well written and powerfully convicting. It is a must read! I highly recommend this book. As I was reading the book, I kept thinking to myself that I needed to go back and compile a handout of all the advice to weaken pride and cultivate humility which C.J. was giving in this book. When I reached the end of the book I found the list already provided in the form of an appendix (pp. 171-172). What a good idea for making this book even more practical! Well I typed out the list from the back which summarizes the final section of the book which focuses on “the practice of humility.” The list is included below. To see all of this material fleshed out you must buy the book however. Mahaney presents this important material with his characteristic ability to both communicate Biblical truth while sharing personal anecdotes along the way to drive the truth home. His works (and this one is no exception) are also full of quotes from and recommendations of favorite authors who have extended treatments of the topic under discussion. This is truly a gold mine! I also came across a free download of a pdf of some of an expanded outline of some of the following on the Sovereign Grace Ministries website. To download this pdf click here. Below is the list which I copied from pages 171-172 of Humility. I placed this material on a 5.5 x 8.5 sheet to print out for handy access as a reminder of the practical suggestions of the book. I recommend that you do the same after experiencing the book in its fulness. 1. Reflect on the wonder of the cross of Christ. 2. Begin your day by acknowledging your dependence upon God and your need for God. 3. Begin your day expressing gratefulness to God. 4. Practice the spiritual disciplines – prayer, study of God’s Word, worship. Do this consistently each day and at the day’s outset if possible. 5. Seize your commute time to memorize and meditate on Scripture. 6. Cast your cares upon Him, for He cares for you. 7. At the end of the day, transfer the glory to God. 8. Before going to sleep, receive this gift of sleep from God and acknowledge His purpose for sleep. 9. Study the attributes of God. 10. Study the doctrines of grace. 11. Study the doctrine of sin. 12. Play golf as much as possible. 13. Laugh often, and laugh often at yourself. 14. Identify evidences of grace in others. 15. Encourage and serve others each and every day. 16. Invite and pursue correction. 17. Respond humbly to trials. That’s a great book…one of the few books that I recommended on my blog.